A complete guide to the best prospects, franchise mode, Road to the Show, Stubs, Diamond Dynasty, Conquest Mode, and more in MLB The Show 18. Best players in MLB The Show 18. MLB The Show 18's Conquest Mode is a core part of the game this year. In this guide to Conquest Mode in MLB The Show 18 we'll detail the four phases and give you all the info you need on the Conquest Mode Rewards in MLB The Show 18. For more help with MLB The Show 18 head over to our MLB The Show 18 guide hub. It's got loads of info on the best prospect players for your team, and more. This is where you send your fan base out to take over empty tiles on the map, or attack a tile belonging to another team. If the space is free, you will automatically take it over. If it’s occupied by another team, you can choose to either “Simulate Game” or “Play Game”. 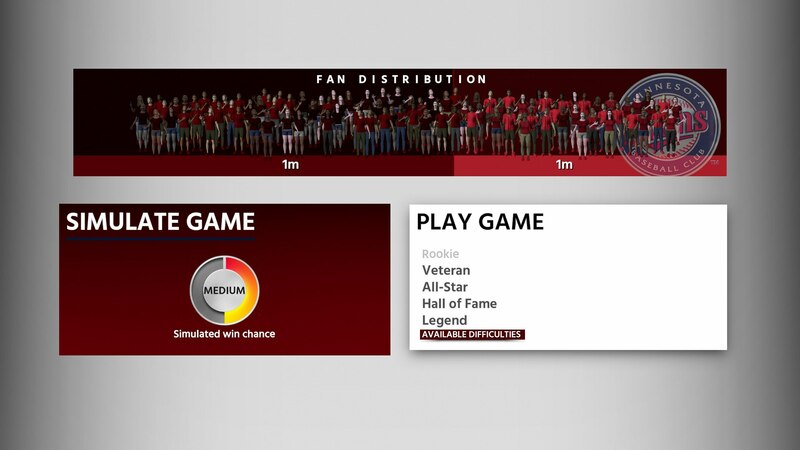 Under the “Simulate Game” option, you’ll see a gauge that will tell you your teams probability of winning the matchup, which is determined by the Fan Distribution shown at the top of the screen. This shows how many fans you are attacking with, and how many of your opponent’s fans are on the tile you are attacking. The more fans you have, the higher likelihood of you winning a simulated matchup. If you decide to “Play Game”, or if you are attacking a team’s stronghold (their home base) where “Play Game” is required, you’ll have to select a difficulty level to play the game on. The available options are determined by the Fan Distribution. The more fans you have attacking, the lower the difficulty you’ll be able to play on. Win the matchup either by simulating or playing, and you’ll take over that tile and it’s fans. Take over all the tiles, and you’ll win Conquest mode. After each Attack Phase, you’ll be given the opportunity to steal fans away from any remaining team’s stronghold. You just decide which team you want to play, and then choose the difficulty level. The higher the difficulty level you decide to play on, the more fans you’ll steal if you win the game. After you’ve completed the Attack and Steal Phases, you’ll get to place fans you’ve won on any of the tiles that you have control of on the map. If you have an excess of fans on a tile, you can move them during this phase. Once this is completed, you’ll go onto your next move, and go back to the Attack Phase. You can go about the map as you please, but some common strategies are going directly towards the Rockies, and taking the land in the northwest before working your way down the west coast. Another is going towards the Twins first, and making your way through the central teams before going either east or west. As you build up your fan base, you should be utilizing the Simulate Game option for all non-stronghold games. At that point, you can also skip the Steal Phase as well. For playing through Conquest and defeating team’s strongholds, you’ll receive a number of rewards. Each stronghold taken completes a Mission to in the Conquest Program. 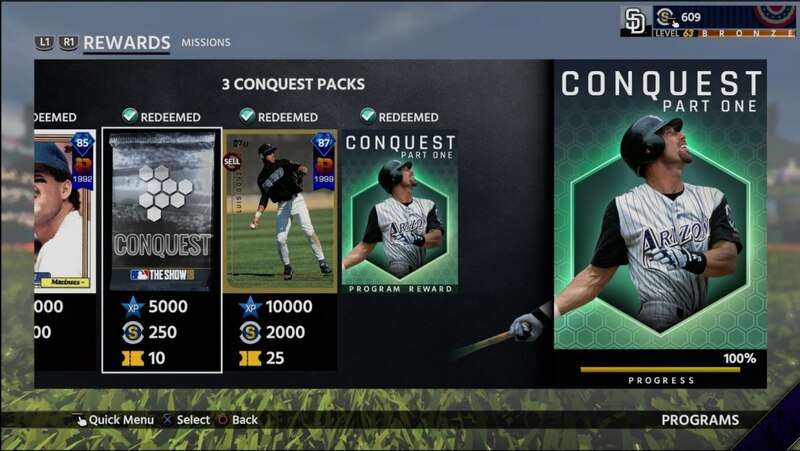 As you progress through the Conquest Program, you will earn players, Tickets, Stubs, XP, and eventually get an 87 Overall Breakout Luis Gonzalez card, and a Program Reward that allows you to begin the Conquest Extreme Program. Defeating certain team’s strongholds will also result in unlocking a Flashback card of a player from that team, and an additional Mission that must be completed with that card. For example, if you defeat the San Francisco Giants, you’ll unlock a Rookie Brandon Crawford card, and a Mission that requires you to collect one hit, and two fielding assists in the same Conquest game. 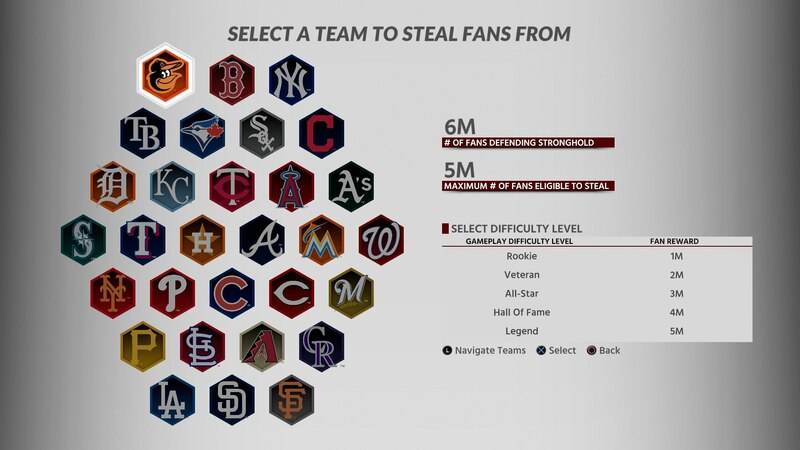 There are two of these hidden missions for each of the six MLB divisions. While doing those, and Advancing them in the Conquest Program, you’ll also be unlocking cards and rewards along the way. Defeating all 30 strongholds will earn you a 10 Standard Pack Bundle, also completing the 12 hidden player Missions will bring you to a total of 60% completion in the Conquest Program. After completing all of the AL, and all of the NL, available Missions in Conquest, two more Missions will unlock for you that require you to use the cards you’ve earned from Conquest to complete stat-based Missions that need to be completed in a single game. Each of those Missions will give you 5% progress towards the Conquest Program. Once those Missions are completed, you’ll unlock four more Missions. Two are stat-based Missions that need to be completed in a single game, and two Exchange Missions, one Player Exchange, and One Souvenir Exchange. Complete those, and you’ll be finished with Conquest Part One. The Conquest Part One Program Reward is used to unlock Conquest Extreme, which rewards you for taking over strongholds in a specific amount of moves, culminating in tasking you with defeating all 30 strongholds in less than 12 moves. 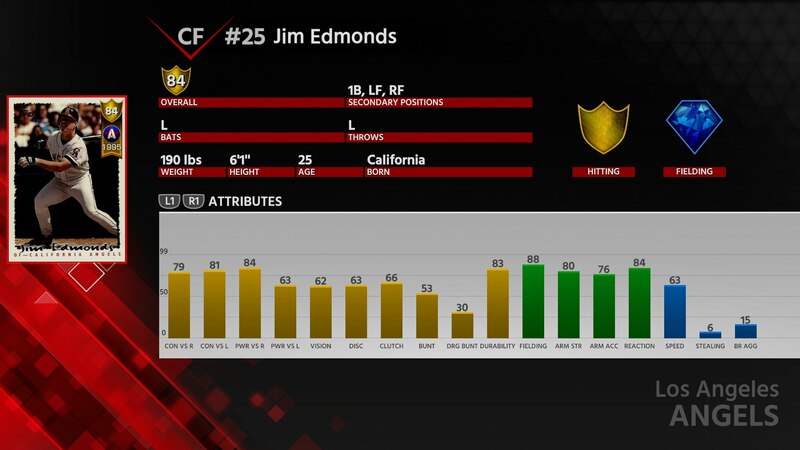 This concludes our MLB The Show 18 Conquest Mode guide, but head over to our guides to the best budget offense players, or the best shortstops in the game.